My grandparents are dying and the world is teetering on the brink of what Twitter keeps calling World War Three and the anxiety is back, kicking and screaming WE TOLD YOU SO and my grandparents, estranged, are dying and in the graveyard the crocuses are coming up. This is a pie for a day like today, and a pie for making peace. My grandparents are dying, so I’ve heard. Someone told my sister, who told me, that they might be. We are de facto estranged. I write to them. They sometimes reply; more often they don’t. I will excuse them this on account of their dying. I haven’t seen them in a long time. Years. There are reasons for this, on my part, and on theirs. I love them. My grandmother, who has been ill my whole life, taught me to make pastry. I wrote about it, and her, here. It feels important to tell you these things now, before. My grandmother is an exceptional pianist, like my sister. My grandmother played the piano for a hundred sitting room productions. My grandfather grew up in a tiny mining village called Jacksondale. I wrote a poem once called The Jacksondale Blues. He let us eat ice-cream for breakfast. He used to tell us stories: let me see what I’ve got up my sleeve, he’d say, shaking out his handkerchief. He was the sort of man, then, who always had a handkerchief. He told good stories, straight from his head: panthers who leapt fully formed from their stone columns outside great houses, menageries of stone animals frozen there by a wicked Earl, the king asleep under the hill. The walls of our bedroom there had fairy wallpaper, and bunk beds, and two dolls with careful Bakelite faces and blinking glass eyes and a black velvet dress with a white lace collar. I looked in the mirror last week and saw that doll: wide eyes, lace collar, black ribbon in my hair. It was unnerving. They used to leave the hall light on. Arthur Mee’s Children’s Encylopaedia was in the hall, all eight volumes. I loved it absolutely. I used to believe that rearranging them would unlock a secret tunnel, out of a detached new build in Stoke-on-Trent and take me under the hill, to the sleeping king. I loved it there; I loved them, and only later did I feel a little like they had failed me when it mattered, protected someone who ought not to have been protected, loved me a little less than they ought. And now they are dying. I haven’t seen them in a long time. I felt, I think, betrayed. They never did anything wrong, only did nothing. They are good people. They are dying. I ought to make my peace with them. I can only make pastry, make pies, and remember, and try to make something I can be at peace with. I am trying, in this pie, to make something they would be proud of. I am trying, in this pie, to make an ending I will not be ashamed of. Making pies requires only patience, and time. Perhaps the same is true of peace, but perhaps I no longer have time. The world might be ending. I no longer have time, but I can maybe make a little, standing in the kitchen, stirring, Tall Man at my side. Breathe in. Breathe out. The world is ending. My grandparents are dying. Remember. Tell stories. Eat together, and remember, and notice, in the graveyard, from bones and earth, the crocuses coming up purple and gold. I made this in a haze; I no longer remember quantities, really, but I suspect it will be okay. This is what I used, I think. Makes one big pie, serves six, or serves two, with plenty for the freezer. This freezes well. Quantity of pastry, puff if poss. Slow cooker; fork; pie dish/es. Observe the beef shin. Observe how blue it is. Should beef shin be blue? A bluish grey slab of binding sinew around red wet flesh. Attempt to dice it, as the little sticker on the package says. Fail. Throw it whole into the slow cooker. Open the fridge. Face, grimly, the vegetable drawer. Face, grimly, the ancient contents of the vegetable drawer. Take the parsnips. Chop them roughly into discs. Chop off the rotten bit. Put the rotten bit in the bin. Put the not rotten parts into the slow cooker. Take the onions: peel off the skin, as far as you can; cut into quarters. Put them into the slow cooker. Take the garlic cloves. Peel them. Cut them in half. Put them in. Shake the sad ends of a bag of dried mushrooms in, too. The lonely shreds of herbs. A glug of olive oil, the glasses of red wine. Plenty of wine. Two beef stock pots, just dropped in, and topped up with boiling water. Maybe the balsamic. Lid on. Set the cooker to hot. Go away. Make pastry. Think. Think. Wish you could stop thinking. Start writing a letter, over and over, in your head. Write a lot of letters. Throw them all away, or delete them, depending on how you write your letters. Call someone. Talk about things completely unrelated to Russia or Ukraine or cancer. Don’t, at any cost, mention cancer. Don’t mention dying. Talk about pies. Talk about stories, if you can. Hang up the phone. Be alone. Your books are reproaching you. Your music is reproaching you. In the mirror your Bakelite face is reproaching you. If you were your grandmother, if you were your sister, you could be playing the piano now. You aren’t. Read. Work. Write. Leave the house. Walk, for a long time, until your hands are so cold you can barely feel the lining in your pockets any more, and then keep walking. Don’t think about Ukraine, or about cancer; think about Ukraine and about cancer and then, as you turn on the road to home, notice that the crocuses in the graveyard are coming up. Instagram them, carefully. Be careful. Notice that they are something lovely, and be surprised that things are still lovely, and be pleased that things are still lovely, even if only for a little while. 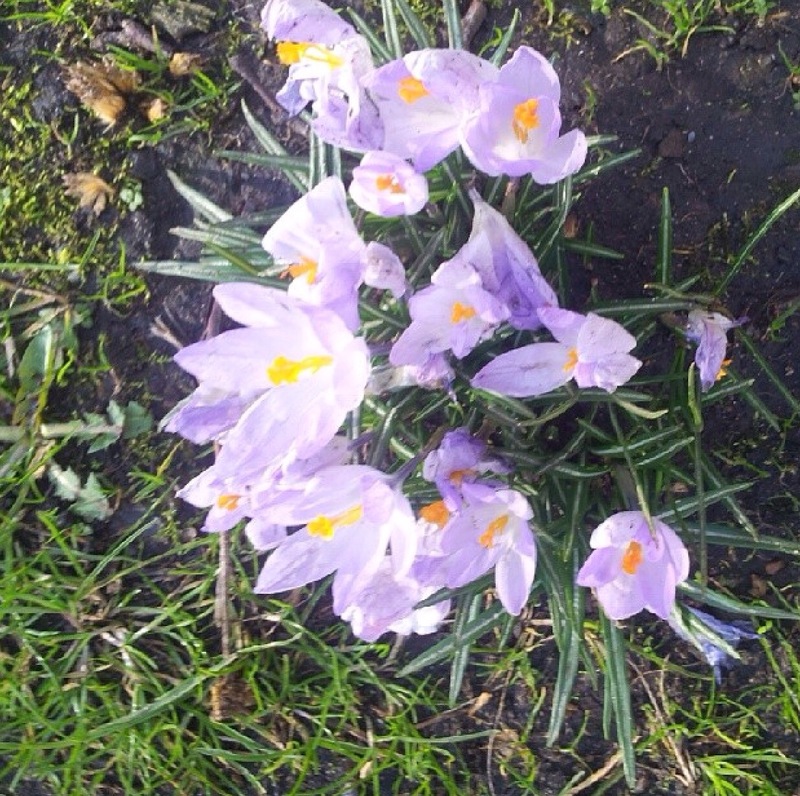 Walk home, with a picture of a crocus in your pocket. You will smell the stew from all the way down the hall, and it will soothe you. Be soothed. Turn the slow cooker to warm; add the can of plum tomatoes, chopped, and a punnet of mushrooms, chopped too. Then make pastry, the way I told you before. Or buy it. You can buy it. If you buy it, buy puff. Puff is wonderful, but nobody needs to make it. Hands in the flour, knead the pastry together. Cold hands make better pastry. Cold hands, warm heart. Chill the pastry; poke at the meat with a fork. If it falls away, roughly and stringily, it’s done. If not, it isn’t. You may need to transfer the stew to the hob to reduce the sauce (I did). Stir it, watch it bubble. Stir it. Lean against Tall Man, or your equivalent, and feel soothed, a little, by how easy this has all been. It’s done it almost on its own. It’s been so easy, and you are so loved. You have always been so loved, and the people who failed you did not do so because they didn’t love you, but because they were scared, and you, too, you understand what it’s like to be scared. You understand what it’s like to be failed, to trust someone who didn’t deserve it. You understand what it’s like to be frightened, and you find that, stirring the dark stew, inhaling the simple smells coming up, you blame them a little less than you did this morning, and you start to think, perhaps, of calling them, maybe. You are so loved. Turn the oven to 180 degrees. 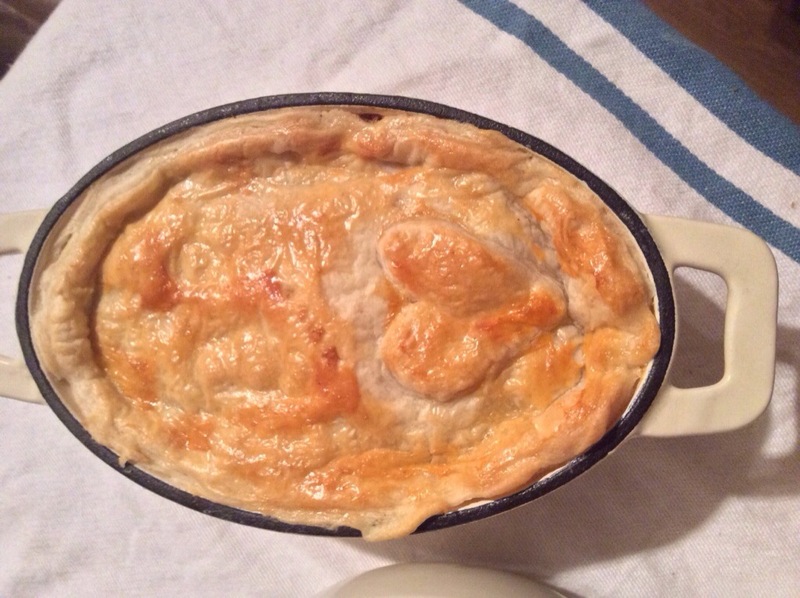 Take the pastry from the fridge, and roll out; use the lid of your pie dish as a template for the pie lid. 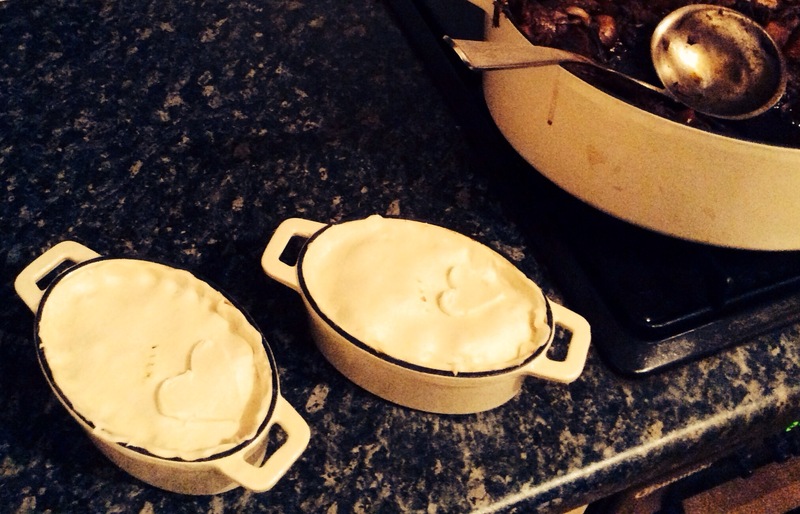 I used two little casserole dishes, filled them fatly with meat, and froze the rest, for a harder day. There are lots of harder days, and it’s good to be prepared. Quickly, so it doesn’t shrink, top the pies with the pastry. Press down around the edges, overlapping. Brush with beaten egg; prick, in the centre, with a fork. Bake for twelve minutes, or until golden, gorgeous brown. 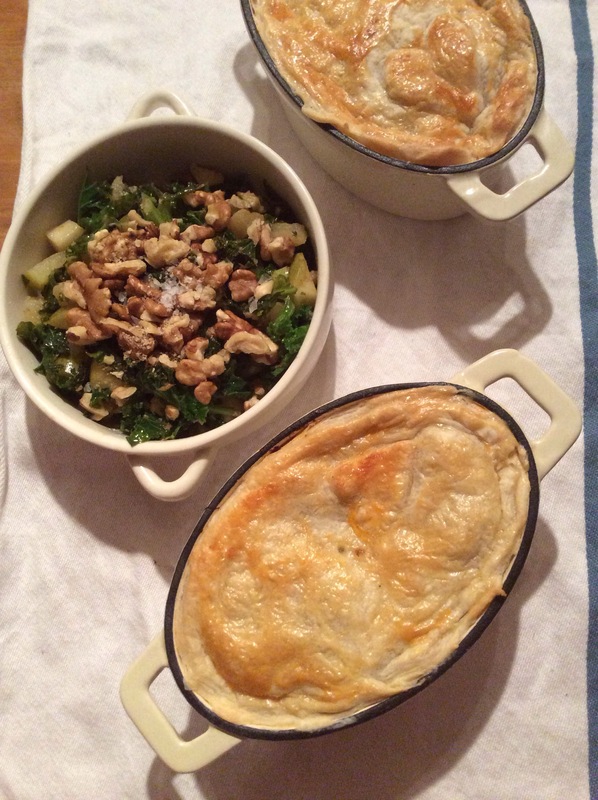 We ate this with some apple-walnut kale, and it was good, and I was loved, and I started to plan, in my head, a letter I would send, a letter as simple as this pie, a letter full of love, and best thoughts, and hope, unlikely and gorgeous crocuses. I haven’t written it yet. But I will. I found your blog today and went back to read more. Your writing is beautiful. I’m going to have to try the recipes when I get home. These posts are the most beautiful things that I have ever read on a cookery blog! Keep up the good writing and the good cooking! Thank you so much. Every single time I read this comment it makes me laugh. I’m sorry that you feel this way and that these things are happening. I’m happy for the way you write and for the recipe for the pie. I’ve been trying to help my own mental health through cooking because of things I read here, I think it’s working. Thank you for that. Some really superb info. Gladiolus I noticed this. “It is only with the heart that one can see rightly what is essential is invisible to the eye.” by Antoine De Saint-Exupery.